We're making time at school to address the what, how & why of this historic time, respectfully & inclusively. There are days when we realize we are living through history that will be long remembered and often referenced. Today strikes me as one that will reside in that category. Almost none of those who claimed to be in the know saw it coming, and while I'll leave it to others to parse this experience, we are sharing in a convulsive phenomenon that has manifested in elections internationally, indicative of our times. Through our big doors this morning walked hundreds and hundreds of young people and many dozens of grownups from households that may have been glued to returns into the wee hours and others whose screens were off, whose bedtimes didn't vary, and here we all are together. USN hasn't, doesn't, and shouldn't endorse political candidates, platforms, or policies. Instead, we embrace the beautiful and time-tested responsibility to help students learn to think for themselves, to reason with civic responsibility in mind. That, it strikes me, is a commitment around which we can rally as we share this campus. A wise colleague once told me to let the scope of a child's question define the breadth of my answer, and that advice wears well. We'll make time today, as appropriate, to address the what, the how, and the why of this historic time, respectfully and inclusively. I am confident this place draws people who rise to that challenge. The other imperative today, in the face of what comes as a nearly unprecedented presidential surprise, is to reiterate our fundamental priorities as a community of people who care about one another, person by person and as a big, intentionally different kind of group that celebrates the idea of learning from difference. If not us, then whom? My strong sense is that the children in our midst will look to us to be a constant for them, to help place this news in context, to confirm that we mean what we say. And happily, there are opportunities everywhere we look to be good to one another. So pardon the sermon if that's how this all sounds, and please send any constructive suggestions my way. We're determined to work our little acre here, without presuming or looking partisan, and we're grateful for the people who make USN possible, across constituencies. We'll seek out the teachable moments, today and in days to come, and I pledge to take none of the strength of the USN community or your trust in us for granted. The importance of education in shaping the arc of American democracy is starkly evident. Now back to work. As always, let me know if we can help on your end. 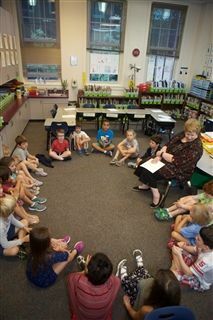 Lower School students gather for their morning meeting.